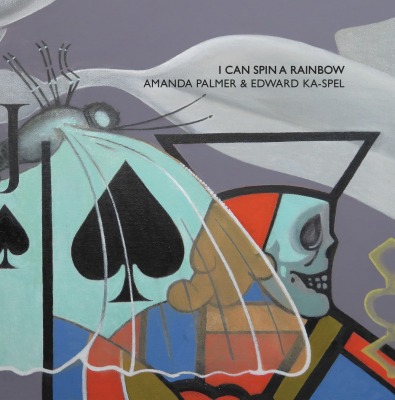 With their new collaborative record, Amanda Palmer & Edward Ka-Spel claim that they can not only spin a yarn, but a full-fledged rainbow. Thankfully, this isn’t an empty boast. The songs here feature long, complex storylines full of fantastic characters and alternate worlds. There’s an underlying darkness to each one, reflecting tensions that the two artists see in their reality now. I Can Spin a Rainbow isn’t musically remarkable. That’s not to imply that the compositions aren’t well-executed—they are. Rather, the music here is so subservient to the stories Palmer and Ka-Spel sing that, often, the instrumental aspect of the songs can take a quiet, subtle form. The light piano and string arrangements on each track often feel like operatic recitatives, where the music takes a minimal approach in order to help the vocalist advance the plotline. When these stories contain some semblance of the real, Palmer and Ka-Spel find the greatest success. “Pulp Fiction” is the welcome party, romanticizing the promise of a new life and the draw of the unknown, forming a powerful escapist anthem. The bleakest track on the record is “The Shock of Kontakt,” the only story that abandons fantasy altogether. The three verses show two characters’ relationship in different stages: impoverished but heartfelt love, deceit and financial instability and eventual disconnection when the narrator’s partner takes the blame for her lover’s crime, leading to a prison sentence. Through all of these trials, “the shock of contact” (both sexual and not) keeps the couple’s love alive. It’s a gloomy but heartfelt story, and Palmer’s expressive delivery gives these emotions tangibility. “The Clock at the Back of the Cage” is another standout, using a lush glockenspiel-based arrangement as its background. The story itself is rooted in a dark scenario, portraying an exploitative circus master and his subjects, one of whom Ka-Spel claims to have known and lost. “How they crowned you, weighted and drowned you / How they made you numb,” sings Palmer, expressing how power can both glorify and diminish at the same time. The track finishes with Ka-Spel showing defeat, given that the captive has done so: “There’s a nice patch of straw, and a comfortable cage,” noting how the trick of contentment can cause people to accept their oppression. Even though the story is fictional, the message feels eerily prescient. Sometimes Palmer and Ka-Spel delve too far into an absurd fantasy and lose focus. Tracks like “Beyond the Beach” and “The Changing Room” feature bizarre characters going to various places, but they never really seem to do much or expose anything. Against the powerful commentary and detailed stories on other tracks, some of the weaker ones feel more like random excursions into goofy and mindless playtime.